Ukrspecsystems has introduced a new lightweight 2-axis gyro-stabilized micro gimbal for fixed-wing and multirotor UAV platforms. The USG-251 is suited to a range of industrial, public safety and military applications, where high-quality imagery is required. The USG-251 micro gimbal features a Full HD EO sensor with 10x optical zoom lens and optical video stabilization. The anti-vibration damping mount eliminates vibrations from the airframe for exceptional image quality, and an optional digital video processing module offers digital video stabilization, target tracking and movement detection. Weighing just 350g, the compact USG-251 micro gimbal can be fitted on most commercially available fixed-wing or multirotor drones. 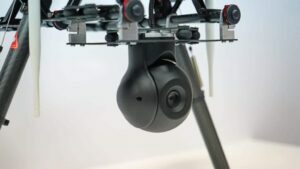 The sealed dome housing allows the gimbal to be used in all weather conditions and the 360 degree rotational capability ensures targets can be tracked in any direction.